Are we in a beef price boom? 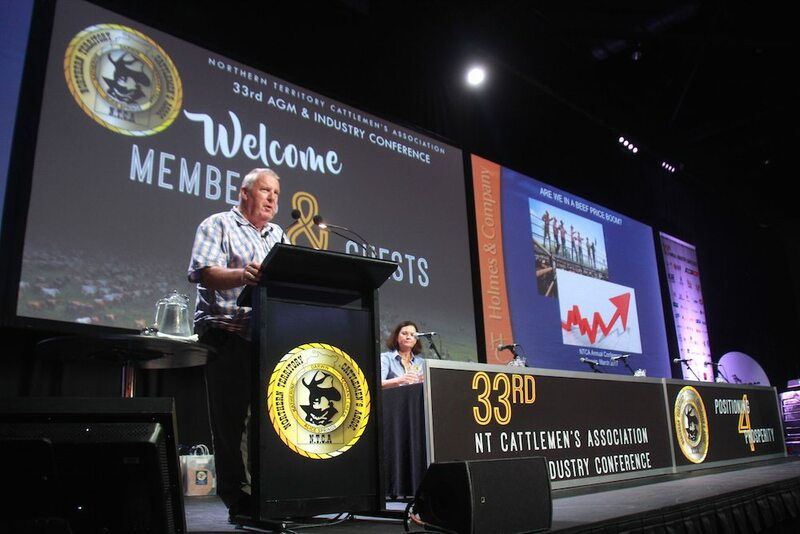 Dr Phil Holmes, Holmes and Company, addresses the NTCA conference in Darwin on March 31. And, whether we are or not, how should cattle producers be allocating the increased capital they have received from improved cattle prices for the best chance of being profitable in the future? 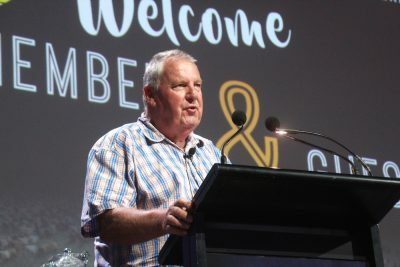 Farm business advisor Dr Phil Holmes, Holmes and Co, was given the task of answering these questions at the recent Northern Territory Cattleman’s Association conference in Darwin. Dr Holmes co-authored the MLA-funded northern beef situation report in 2013, which analysed 12 years of business data from 5000 individual cattle properties in northern Australia. The aim of the analysis was to check the financial health of northern cattle producing businesses, and to highlight what the top 25pc of producers were doing that average producers weren’t, to give the latter clear guidelines on how to improve the financial performance of their operations. The analysis produced a sobering conclusion that the majority of northern beef producers were not generating profits sufficient to fund current and future liabilities. Dr Holmes has been benchmarking operations and delivering blunt messages to northern cattle production audiences for several years now, urging producers not to focus on chasing higher prices, but instead on improving productivity. In his 35 minute address in Darwin, Dr Holmes offered his thoughts on whether we’re in a beef boom (he doesn’t think we are); the relationship between cattle prices and business profitability (he says benchmarking figures show there isn’t one), and his view on where producers should be spending dollars to improve profitability (on lifting productivity, by targeting higher reproductive rates, lower mortality rates, and higher turnoff weights). Dr Holmes opened by denunciating the strategy of chasing premium markets, which he described as a foolish and a flawed approach. Becoming pre-occupied with the beef price was a complete waste of time and a distraction, he said. In fact, Dr Holmes revealed that he pays almost no attention to the actual price of cattle. “To me it doesn’t matter,” he explained. “A rising beef price is like the rising tide, it raises all boats. 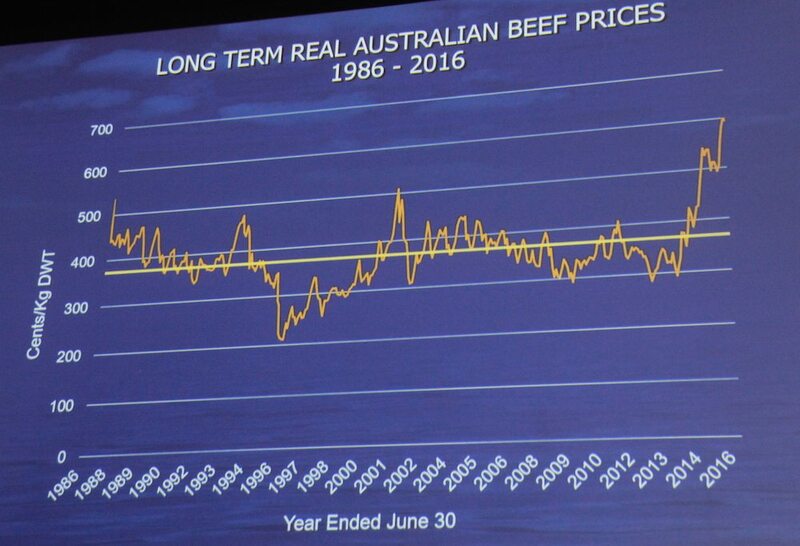 These comments were made as he presented a chart showing average Australian beef prices over the past 30 years, equated to December 2016 dollars (below). 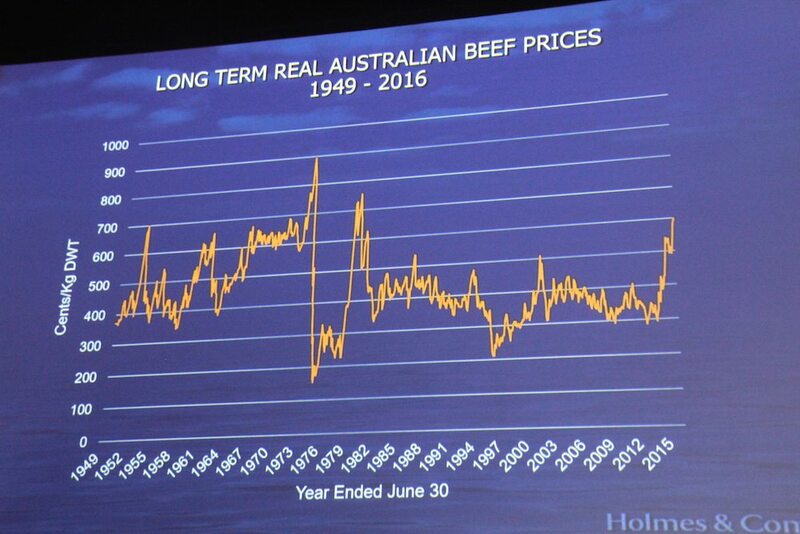 The chart reinforces an important point, Dr Holmes says: the amount of profit before interest and tax in any decade in the beef industry will be generated in three of those 10 years. This was true in the north and the south, and for wheat and wool growing operations too. So are we in a beef boom? For most of the 30 years documented in the above chart, the price has traded in a channel of 300-500c/kg dressed weight (or $1.50-$2.50 liveweight). The yellow line added to the chart below is the trend line. “It is essentially flat, it is not going anywhere really,” Dr Holmes said. “In order for that line to be lifted up, to be an increasing trend over time, what is happening now either has to go higher or go on for longer. “Is this a fundamental change and are we now in for a new era of prosperity? Maybe, but when you look at that data, the answer is probably not. Business return and the cost of capital: The business return has to exceed the cost of capital (the cost of debt), otherwise you are destroying wealth, Dr Holmes said. Where businesses are deploying capital and their business return is less than the cost of debt, one of the first things they have to throw capital at is debt reduction. Funding operational expenditure: If operational expenditure is being funded out of an overdraft, and the overdraft never gets in the black, the bank is partially funding your operating expenses, and that is unsustainable in the long run. Owner remuneration: Owner remuneration for a male/female partnership team should be $170,000 ($140,000 in wages, which is the average full times earnings of an Australian male and female worker, and $30,000 in non-cash benefits from living on site, car, phone, fuel etc). If the farm business can’t support that level of owner drawings, then it is the owner lifestyle that is propping up the business. Debt principal repayment: Interest only loans that go on for more than one or two years are “disastrous financially”, Dr Holmes said. “You have to be able to pay debt principal”. Maintaining a safe level of equity: “If you have an average business, unless your level of equity is about 85pc, the business will be unsustainable in the long run, simply because after you have paid that interest out there is not enough money left over to do all the provisioning for the future”. Ability to provision for succession, provision for independent retirement, and maintain environmental capital were also critical for a business to be sustainable in the long term. The more important question: how should capital be allocated? With more working capital in the system following successive years of stronger cattle markets, how should producers allocate that capital rationally and effectively for future prosperity? Debt management: Dr Holmes’ advice is that businesses with equity levels significantly below 85pc should be allocating most of their working capital to debt reduction. There is a widespread and pervasive view in Australian agriculture that it is better to pay interest than tax. “If you believe it to the point where you actively practice it, it is financial illiteracy,” Dr Holmes said. Operating scale: Data from the northern beef report and other sources showed that northern beef operations with less than 1500 Adult Equivalents (AEs) were not financially sustainable. “If you’re seriously under scale – definitely under 1500 AEs, possibly under 2000 AEs – then overheads are always going to kill you, there won’t be enough AEs out there to spread the overhead costs over. But nor does bigger and bigger and bigger mean better and better and better. It does to a point. But beyond that point there is more likelihood that business performance will deteriorate through diseconomies of scale, where growth does not bring any changes to the return on equity, cost of production or the inherent profitability of the business. Dollars are best spent on improving productivity: Dr Holmes said three drivers of productivity were labour, land and livestock. Labour efficiency in the north has been significantly improved, although he questioned the continued use of horses instead of motorbikes on many northern properties. Three factors – reproductive rate, mortality rate and turnoff weight – underpin the key performance indicator for livestock productivity. Small changes in those three drivers – such as increasing reproductive rate from 58pc to 68pc, decreasing mortality rates from 9pc to 4pc, and increasing turnoff weight from 300kg to 380kg, made very big differences to business profitability. “If you drop the mortality rate, you have more breeders having more calves that turn off more kilos through saleweight, so you have a multiplication sign between each of the individual factors. Northern producers have to be disciplined in the way they allocate capital, otherwise, prosperity will remain elusive. That meant being better informed to be able to read landscape condition, and how to manage the three elements of productivity within their herds. “What makes the difference between people who do this stuff properly, and those who don’t? The most important being overgrazing ! Matching stocking rate to carrying capacity whilst moving soil health & biodiversity of plants species foward is were attitude has to change. Your wealth comes from grass not necessarily cattle. Some solid home truths there.